Our second annual AWS Summit in Bahrain took place on Sunday, September 30th in Manama, Bahrain, under the patronage of His Royal Highness the Crown Prince. More than 2,000 attendees including His Highness the Deputy Prime Minister and dignitaries within the Bahraini government joined us to get inspired and gain the technical knowledge needed to get more from the cloud. The event included 15 sessions across three tracks – management, technical, and spotlight. The Summit also featured those in the Middle East who have made impressive use of the cloud to foster a spirit of innovation in the region. The keynote featured customer vignettes from iGA egovernment authority, Madoow3, Al Tayyar Travel Group, and Ureed.com. 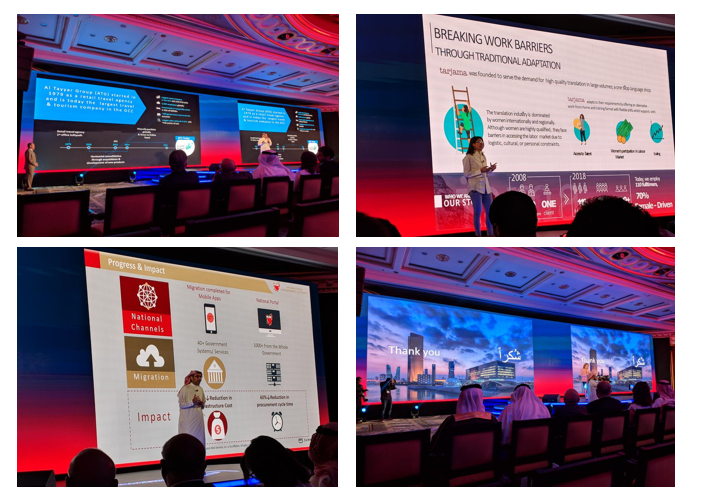 Mohammed Ali Al Qaed, Chief Executive at IGA , spoke about their cloud-first policy, the progress they continue to make in the region in preparing for a 21st century economy, lowering infrastructure costs, and decreasing the length of time to procure technology. Rami Al Qawasmi, founder and CEO at Madoow3, spoke about how they are leveraging artificial intelligence (AI) to enable the world’s largest Arabic content site. They developed their own voice-enabled technology called “Salma.” Salma has two main business models: one as B2C for servicing Arabic-native speakers with knowledge and another B2B model in which they work with other global services to provide localized Arabic voice interface to their users, such as e-governments, customer service departments of telecom companies, travel companies for online booking, financial institutions for managing bank accounts, and music services. Abdul Rahman Mutrib, Executive Vice President at Al Tayyar Travel Group, spoke about how they have transformed their business through the use of cloud technology. Today, they are the largest travel group in the GCC. By using machine learning, they are able to create a more personalized customer experience. They are also using AWS Lambda to scale and accommodate fluctuations in the travel business. Nour Al Hassan, CEO at Ureed.com, discussed how they use the cloud to provide translations services internationally. Ureed.com was founded by a local entrepreneur and employs primarily women as freelance translators. Women make up the majority of the translators in the world, but were previously underrepresented in the region. It is a priority of theirs to remove barriers and get more women involved in the industry. In addition to the keynote sessions, the We Power Tech event featured a fireside chat with Teresa Carlson, moderated by Mary Camarata. Themes included how AWS’s commitment to increasing underrepresented groups in technology not only makes a stronger workforce, but also helps AWS remain customer obsessed for an increasingly diverse group of AWS customers. Teresa highlighted that, while significant progress has been made to date, there are positive steps that can be taken to increase workplace ratios and intake percentages of underrepresented students for technology-related studies. The chat was followed by group roundtables that were led by mentors from the AWS and C5 Nebula communities. These collaborative roundtables included participants’ input and recommendations on how to tackle some of the issues and challenges facing women in technology, and the wider workforce, in Bahrain and across the region. During the event, AWS also announced it is bringing a special “We Power Tech Day in the Cloud” training dedicated to cloud technology learning for women in Bahrain, in collaboration with C5 Nebula. Taking place on November 7th, the one-day complimentary course will be given by AWS certified trainers and will help women learn about the fundamentals of AWS cloud technology, and set them up for next steps in their cloud journey, including official AWS certification. Registration for the training is now open and can be found on C5Nebula.com. Thank you to all of our sponsors who helped make the Summit a success!